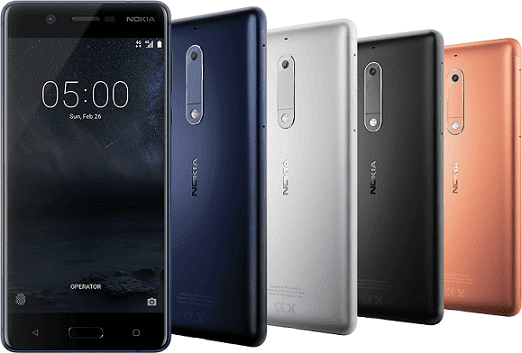 Nokia 5 features a metal body with a 5.2-inch IPS display protected with Corning Gorilla Glass. The display offers a resolution of 720 x 1280 pixels. You get an 8 megapixels camera in the front for taking selfies and making video calls. Nokia 5 features a 13 megapixels camera on the back. The camera offers dual-LED flash, phase detection autofocus, face detection, and HDR. Nokia 5 runs Android 7.1.1 (Pure Android) on the 1.4GHz octa-core Qualcomm Snapdragon 430 with 2GB RAM. This is the same chipset available on the Nokia 6. 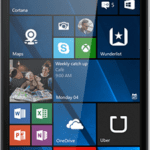 Nokia 5 sports 16GB internal storage and supports up to 128GB memory card. It supports Bluetooth 4.1, NFC, microUSB 2.0, and Wi-Fi. Nokia 5 supports 4G LTE with download speeds of up to 150Mbps. In Nigeria, the Nokia 5 will support LTE on all major networks including Etisalat, Glo Mobile, MTN, NTel, InterC, and Smile. Nokia 5 is now available in Nigeria, Kenya, and Ghana. It started shipping worldwide in the second quarter of 2017 starting at a price of around 189 Euros. You can buy the Nokia 5 at leading online stores in Nigeria, Ghana, and Kenya. Nokia 5 Price in Nigeria ranges from 67,500 Naira to 85,000 Naira depending on your location.